The app is an additional channel of communication designed to help keep you better informed. It offers some resilience for other channels of communication. 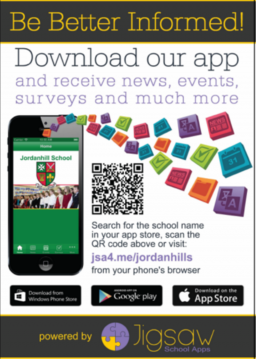 The app is used to share some News items and to issue reminders of upcoming events. The calendar of events is synchronised with a new calendar on our web site, but cannot access any attachments on the web site calendar. The app is not used to share more complex information. Pupil specific information is issued via targeted e-mails from our management information system. Please note that the app is compatible with iPads, but to download it you have to search the store in “iPhone Only” mode. Push Notifications so you get a notice each time we add something.